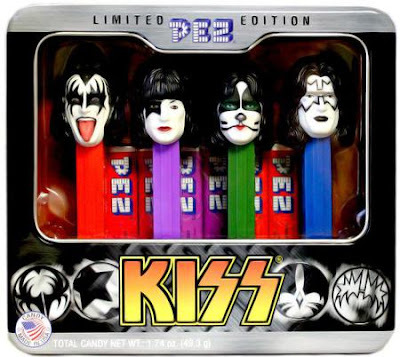 PEZ Candy, Inc. have announced that the PEZ KISS Gift Set has begun to ship to national retailers and will soon be available on store shelves. The KISS gift set includes four dispensers, depicting the four members of the band, and includes one six pack of candy. The Starchild, The Demon, The Catman, and The Spaceman are displayed in a reusable metal gift tin. The set will retail for approximately $12.99. KISS recently released their 20th studio album, “Monster.” The band kick off a South American tour in Buenos Aires on November 7.